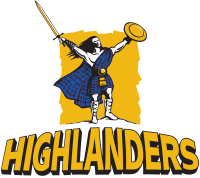 The Highlanders (formerly known as Otago Highlanders) are a New Zealand professional rugby union team based in Dunedin that compete in SupeRugby. The franchise represents the North Otago, Otago and Southland provincial Rugby unions. The Highlanders take their name from the Scottish immigrants that helped found the Otago, North Otago, and Southland regions in the 1840s and 1850s. Their main ground through the 2011 Super Rugby season is Carisbrook in Dunedin, with home games occasionally being played in Invercargill and Queenstown. The Highlanders will move into Carisbrook's replacement, Forsyth Barr Stadium at University Plaza, starting with the 2012 season; the stadium is scheduled to open in time for the 2011 Rugby World Cup, but after the Super Rugby season. The franchise was formed in 1996 to represent the lower South Island in the newly formed Super 12 competition. They finished the inaugural season eighth, and the following season finished last after winning only three of eleven matches. However in the 1998, 1999 and 2000 seasons they qualified for semi-finals; the best result in their history was in 1999 when they hosted the competition final against fellow South Island team the Crusaders. They lost the match 24-19, and the following year were again knocked out by the Crusaders-this time in their semi-final. Since then they have only finished in the top four once more, in 2002. Between the 2003 and 2007 seasons the team has finished ninth three times and eighth once. Former Highlander, Anton Oliver has played a record 127 games for the franchise, and thirteen other players have played over 50 games for the team. The Highlanders' highest career points scorer is Tony Brown with 817 points, and highest career try scorer is Jeff Wilson with 35. They are currently coached by Jamie Joseph and are captained, starting in the 2011 season, by Jamie Mackintosh.